I was on a vendor call last week and they were discussing their recent technological advances in quantum computing. During the discussion they mentioned a number of ways to code for quantum computers. The currently most popular one is based on the QIS (Quantum Information Software) Kit. I went looking for a principle of operations on quantum computers. Ssomething akin to the System 360 Principles of Operations Manual that explained how to code for an IBM 360 computer. But there was no such manual. Instead there is a paper, on the Open Quantum Assembly Language (QASM) that describes the Quantum computational environment and coding language used in QIS Kit. It appears that quantum computers can be considered a special computational co-proccesor engine, operated in parallel with normal digital computation. This co-processor happens to provide a quantum simulation. One programs a quantum computer by creating a digital program which describes a quantum circuit that uses qubits and quantum registers to perform some algorithm on those circuits. The quantum circuit can be measured to provide a result which more digital code can interpret and potentially use to create other quantum circuits in a sort of loop. There are four phases during the processing of a QIS Kit quantum algorithm. QASM compilation which occurs solely on a digital computer. QASM source code describing the quantum circuit together with compile time parameters are translated into a quantum PLUS digital intermediate representation. Circuit generation, which also occurs on a digital computer with access to the quantum co-processor. The intermediate language compiled above is combined with other parameters (available from the quantum computer environment) and together these are translated into specific quantum building blocks (circuits) and some classical digital code needed and used during quantum circuit execution. Post-Processing, which takes place on a digital computer and uses the results from the quantum circuit(s) execution and other intermediate results and processes these to either generate follow-on quantum circuits or output ae final result for the quantum algorithm. As qubit coherence only last for a short while, so results from one execution of a quantum circuit cannot be passed directly to another execution of quantum circuits. Thus these results have to be passed through some digital computations before they can be used in subsequent quantum circuits. A qubit is a quantum bit. Quantum circuits don’t offer any branching as such. The only storage for QASM are classical (digital) registers (creg) and quantum registers (qreg) which are an array of bits and qubits respectively. There are limited number of built-in quantum operations that can be performed on qregs and qubits. One described in the QASM paper noted above is the CNOT operation, which flips a qubit, i.e., CNOT alb will flip a qubit in b, iff a corresponding qubit in a is on. Quantum circuits are made up of one or more gate(s). Gates are invoked with a set of variable parameter names and quantum arguments (qargs). QASM gates can be construed as macros that are expanded at runtime. Gates are essentially lists of unitary quantum subroutines (other gate invocations), builtin quantum functions or barrier statements that are executed in sequence and operate on the input quantum argument (qargs) used in the gate invocation. Opaque gates are quantum gates whose circuits (code) have yet to be defined. Opaque gates have a physical implementation may yet be possible but whose definition is undefined. Essentially these operate as place holders to be defined in a subsequent circuit execution or perhaps something the quantum circuit creates in real time depending on gate execution (not really sure how this would work). In addition to builtin quantum operations, there are other statements like the measure or reset statement. The reset statement sets a qubit or qreg qubits to 0. The measure statement copies the state of a qubit or qreg into a digital bit or creg (digital register). There is one conditional command in QASM, the If statement. The if statement can compare a creg against an integer and if equal execute a quantum operation. There is one “decision” creg, used as an integer. By using IF statements one can essentially construct a case statement in normal coding logic to execute quantum (circuits) blocks. Quantum logic within a gate can be optimized during the compilation phase so that they may not be executed (e.g., if the same operation occurs twice in a gate, normally the 2nd execution would be optimized out) unless a barrier statement is encountered which prevents optimization. In 2016, IBM started offering quantum computers in its BlueMix cloud through the IBM Quantum (Q) Experience. The IBM Q Experience currently allows researchers access to 5- and 16-qubit quantum computers. There are three pools of quantum computers: 1 pool called IBMQX5, consists of 8 16-qubit computers and 2 pools of 5 5-qubit computers, IBMQX2 and IBMQX4. As I’m writing this, IBMQX5 and IBMQX2 are offline for maintenance but IBMQX4 is active. Google has recently released the OpenFermion as open source, which is another software development kit for quantum computation (will review this in another post). Although Google also seems to have quantum computers and has provided researchers access to them, I couldn’t find much documentation on their quantum computers. Two other companies are working on quantum computation: D-Wave Systems and Rigetti Computing. Rigetti has their Forest 1.0 quantum computing full stack programming and execution environment but I couldn’t easily find anything on D-Wave Systems programming environment. Last month, IBM announced they have constructed a 50-Qubit quantum computer prototype. IBM has also released 20-Qubit quantum computers for customer use and plans to offer the new 50-Qubit computers to customers in the future. QASM control flow, Open Quantum Assembly Language, by A. Cross, et al. At Storage Field Day 12 (SFD12) this week we talked with Excelero, which is a startup out of Israel. They support a software defined block storage for Linux. Excelero depends on NVMe SSDs in servers (hyper converged or as a storage system), 100GBE and RDMA NICs. (At the time I wrote this post, videos from the presentation were not available, but the TFD team assures me they will be up on their website soon). I know, yet another software defined storage startup. Well yesterday they demoed a single storage system that generated 2.5 M IO/sec random 4KB random writes or 4.5 M IO/Sec random 4KB reads. I didn’t record the random write average response time but it was less than 350µsec and the random read average response time was 227µsec. They only did these 30 second test runs a couple of times, but the IO performance was staggering. But they used lots of hardware, right? 24-Intel 2.5″ 400GB NVMe SSDs. They also had a Dell Z9100-ON Switch supporting 32 X 100Gbs QSFP28 ports and I think they were using 4 hosts but all this was not part of the storage target system. I don’t recall the CPU processor used on the target but it was a relatively lowend, cheap ($300 or so) dual core, Intel standard CPU. I think they said the total target hardware cost $13K or so. I priced out an equivalent system. 24 400GB 2.5″ NVMe Intel 750 SSDs would cost around $7.8K (Newegg); the 2 Mellanox ConnectX-5 cards $4K (Neutron USA); and the SuperMicro plus an Intel Cpu around $1.5K. So the total system is close to the ~$13K. But it burned out the target CPU, didn’t it? During the 4.5M IO/sec random read benchmark, the storage target CPU was at 0.3% busy and the highest consuming process on the target CPU was the Linux “Top” command used to display the PS status. Excelero claims that the storage target system consumes absolutely no CPU processing to service an 4K read or write IO request. All of IO processing is done by hardware (the R(DMA)-NICs, the NVMe drives and PCIe bus) which bypasses the storage target CPU altogether. We didn’t look at the host cpu utilization but driving 4.5M IO/sec would take a high level of CPU power even if their client software did most of this via RDMA messaging magic. Their client software running in the Linux host is roughly equivalent to an iSCSI initiator but talks a special RDMA protocol (patent pending by Excelero, RDDA protocol) that adds an IO request to the NVMe device submission queue and then rings the doorbell on the target system device and the SSD then takes it off the queue and executes it. In addition to the submission queue IO request they preprogram the PCIe MSI interrupt request message to somehow program (?) the target system R-NIC to send the read data/write status data back to the client host. So there’s really no target CPU processing for any NVMe message handling or interrupt processing, it’s all done by the client SW and is handled between the NVMe drive and the target and client R-NICs. The result is that the data is sent back to the requesting host automatically from the drive to the target R-NIC over the target’s PCIe bus and then from the target system to the client system via RDMA across 100GBE and the R-NICS and then from the client R-NIC to the client IO memory data buffer over the client’s PCIe bus. Writes are a bit simpler as the 4KB write data can be encapsulated into the submission queue command for the write operation that’s sent to the NVMe device and the write IO status is relatively small amount of data that needs to be sent back to the client. Of course the NVMe protocol is set up to transfer up to 4KB of data with a (write command) submission queue element. And the PCIe MSI interrupt return message can be programmed to (I think) write a command in the R-NIC to cause the data transfer back for a read command directly into the client’s memory using RDMA with no CPU activity whatsoever in either operation. As long as your IO request is less than 4KB, this all works fine. There is some minor CPU processing on the target to configure a LUN and set up the client to target connection. They essentially only support replicated RAID 10 protection across the NVMe SSDs. They also showed another demo which used the same drive both across the 100Gbs Ethernet network and in local mode or direct as a local NVMe storage. The response times shown for both local and remote were within 5µsec of each other. This means that the overhead for going over the Ethernet link rather than going local cost you an additional 5µsec of response time. In addition to their standalone (disaggregated) storage target solution they also showed an (aggregated) Linux based, hyper converged client-target configuration with a smaller number of NVMe drives in them. This could be used in configurations where VMs operated and both client and target Excelero software was running on the same hardware. The product has no advanced data services. no high availability, snapshots, erasure coding, dedupe, compression replication, thin provisioning, etc. advanced data services are all lacking. But if I can clone a LUN at lets say 2.5M IO/sec I can get by with no snapshotting. And with hardware that’s this cheap I’m not sure I care about thin provisioning, dedupe and compression. Remote site replication is never going to happen at these speeds. Ok HA is an important consideration but I think they can make that happen and they do support RAID 10 (data mirroring) so data mirroring is there for an NVMe device failure. But if you want 4.5M 4K random reads or 2.5M 4K random writes on <$15K of hardware and happen to be running Linux, I think they have a solution for you. They showed some volume provisioning software but I was too overwhelmed trying to make sense of their performance to notice. Yes it really screams for 4KB IO. But that covers a lot of IO activity these days. And if you can do Millions of them a second splitting up bigger IOs into 4K should not be a problem. As far as I could tell they are selling Excelero software as a standalone product and offering it to OEMs. They already have a few customers using Excelero’s standalone software and will be announcing OEMs soon. I really want one for my Mac office environment, although what I’d do with a millions of IO/sec is another question. Read an article the other day on the progress in self-driving cars in NewsAtlas (DMV reports self-driving cars are learning — fast). More details are available from their source (CA [California] DMV [Dept. of Motor Vehicles] report). The article reported on what’s called disengagement events that occurred on CA roads. This is where a driver has to take over from the self-driving automation to deal with a potential mis-queue, mistake, or accident. It appears as if Waymo, Google’s self-driving car spin out, is way ahead of the pack. It reported only 124 disengages for 636K mi (~1M km) or ~1 disengage every ~5.1K mi (~8K km). This is ~4.3X better rate than last year, 1 disengage for every ~1.2K mi (1.9K km). There was no information on previous years activities so no data on how competitors had improved over the last year. Please note: the report only applies to travel on California (CA) roads. Other competitors are operating in other countries and other states (AZ, PA, & TX to name just a few). However, these rankings may hold up fairly well when combined with other state/country data. Thousand(s) of kilometers should be adequate to assess self-driving cars disengagement rates. In addition, according to a Recode, (The Google car was supposed to disrupt the car industry) article, Waymo is moving from a (self-driving automation) software supplier to a hardware and software supplier to the car industry. Apparently, Google has figured out how to reduce their sensor (hardware) costs by a factor of 10X, bringing the sensor package down from $75K to $7.5K, (most probably due to a cheaper way to produce Lidar sensors – my guess). So now Waymo is doing about ~65 to ~1000 X more (CA road) miles than any competitor, has a much (~8 to ~243 X) better disengage rate and is moving to become a major auto supplier in both hardware and software. If the 20th century was defined by the emergence of the automobile, the 21st will probably be defined by dominance of autonomous operations. Was talking with Qumulo‘s CEO Peter Godman earlier this week for another GreyBeards On Storage Podcast (not available yet). One thing he said which was hard for me to comprehend was that they were putting out a new storage software release every 2 weeks. Their customers are updating their storage system software every 2 weeks. In my past life as a storage systems development director, we would normally have to wait months if not quarters before customers updated their systems to the latest release. As a result, we strived to put out an update at most, once a quarter with a major release every year to 18 months or so. To me releasing code to the field every two weeks sounds impossible or at best very risky. Then I look at my iPhone. I get updates from Twitter, Facebook, LinkedIN and others, every other week. And Software-as-a-service (SaaS) solutions often update their systems frequently, if not every other week. Should storage software be any different? It turns out Peter and his development team at Qumulo have adopted SaaS engineering methodology, which I believe uses Agile development. Individuals and interaction – leading to co-located teams, with heavy use of pair programming, and developer generated automated testing, rather than dispersed teams with developers and QA separate but (occasionally) equal. Working software – using working software as a means of validating requirements, showing off changes and modifying code rather than developing reams of documentation. Responding to change – changing direction in real time using immediate customer feedback rather than waiting months or a year or more to change development direction to address customer concerns. 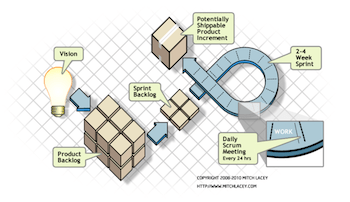 In addition to all the above, Agile development typically uses Scrum for product planning. An Agile Scrum (see picture above & Wikipedia article) is a weekly (maybe daily) planning meeting, held standing up and discussing what changes go into the code next. This is all fine for application development which involves a few dozen person years of effort but storage software development typically takes multiple person centuries of development & QA effort. In my past life, our storage system regression testing typically took 24 hours or more and proper QA validation took six months or more of elapsed time with ~ 5 person years or so of effort, not to mention beta testing the system at a few, carefully selected customer sites for 6 weeks or more. How can you compress this all into a few weeks? With Agile, you probably aren’t beta testing a new release for 6 weeks anywhere, anymore. While you may beta test a new storage system for a period of time you can’t afford the time to do this on subsequent release updates anymore. Next, there is no QA. It’s just a developer/engineer and their partner. Together they own code change and its corresponding test suite. When one adds functionality to the system, it’s up to the team to add new tests to validate it. Test automation helps streamline the process. Finally, there’s continuous integration to the release code in flight. Used to be a developer would package up a change, then validate it themselves (any way they wanted), then regression test it integrated with the current build, and then if it was deemed important enough, it would be incorporated into the next (daily) build of the software. If it wasn’t important, it could wait on the shelf (degenerating over time due to lack of integration) until it came up for inclusion. In contrast, I believe Agile software builds happen hourly or even more often (in real time perhaps), changes are integrated as soon as they pass automated testing, and are never put on the shelf. Larger changes may still be delayed until a critical mass is available, but if it’s properly designed even major changes can be implemented incrementally. Once in the build, automated testing insures that any new change doesn’t impact working functionality. Due to the length of our update cycle, we often had 2 or more releases being validated at any one time. Unclear to me whether Agile allows for multiple releases in flight as it just adds to the complexity and any change may have to be tailored for each release it goes into. Vendors are probably not doing this with hardware that’s also undergoing significant change. Trying to do both would seem suicidal. Hardware modifications often introduce timing alterations that can expose code bugs that had never been seen before. Hardware changes also take a longer time to instantiate (build into electronics). This can be worked around by using hardware simulators but timing is often not the same as the real hardware and it can take 10X to 100X more real-time to execute simple operations. Nonetheless, new hardware typically takes weeks to months to debug and this can be especially hard if the software is changing as well. Similar to hardware concerns, OS or host storage protocol changes (say from NFSv3 to NFSv4) would take a lot more testing/debugging to get right. So it helps if the hardware doesn’t change, the OS doesn’t change and the host IO protocol doesn’t change when your using Agile to develop storage software. The other thing that we ran into is that over time, regression testing just kept growing and took longer and longer to complete. We made it a point of adding regression tests to validate any data loss fix we ever had in the field. Some of these required manual intervention (such as hardware bugs that need to be manually injected). This is less of a problem with a new storage system and limited field experience, but over time fixes accumulate and from a customer perspective, tests validating them are hard to get rid of. Although a lot of hardware these days is implemented as ASICs, it can also be implemented via Field Programmable Gate Arrays (FPGAs). Some FPGAs can be configured at runtime (see Wikipedia article on FPGAs), that is in the field, almost on demand. FPGA programming is done using a hardware description language, an electronic logic coding scheme. It looks very much like software development of hardware logic. Why can’t this be incrementally implemented, continuously integrated, automatically validated and released to the field every two weeks. As discussed above, the major concern is that new hardware introducing timing changes which expose hard to find (software and hardware) bugs. And incremental development of original hardware, seems akin to having a building’s foundation changing while your adding more stories. One needs a critical mass of hardware to get to a base level of functionality to run storage functionality. This is less of a problem when one’s adding or modifying functionality for current running hardware. I suppose Qumulo’s use of Agile shouldn’t be much of a surprise. They’re a startup, with limited resources, and need to play catchup with a lot of functionality to implement. It’s risky from my perspective but you have to take calculated risks if your going to win the storage game. You have to give Qumulo credit for developing their storage using Agile and being gutsy enough to take it directly to the field. Let’s hope it continues to work for them.